Published: Jan. 9, 2014 at 03:12 p.m. Updated: Jan. 9, 2014 at 07:26 p.m. The Tennessee Titans' coaching search is coming into clearer focus. NFL Media Insider Ian Rapoport reported Thursday that Seattle Seahawks defensive coordinator Dan Quinn has emerged as a top candidate for the Titans, according to sources familiar with the search. Quinn rejoined the Seahawks' staff after Gus Bradley left his defensive coordinator post to become coach of the Jacksonville Jaguars. Quinn was the Seahawks' defensive line coach in 2009 and 2010 before taking the defensive coordinator job at the University of Florida. 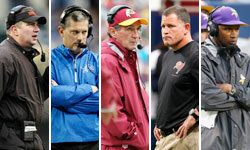 Quinn has the inside track on the Titans job, but he's not the only coach being targeted. Baltimore Ravens offensive coordinator Jim Caldwell, Cincinnati Bengals defensive coordinator Mike Zimmer and San Diego Chargers offensive coordinator Ken Whisenhunt are also viewed as candidates, according to Rapoport. The team also hopes to interview Seahawks offensive coordinator Darrell Bevell after the weekend. The Titans are searching to replace Mike Munchak, who was fired Saturday after refusing to dismiss several of his assistant coaches.